What do the Kidneys Remove? Were it not for the two filters located in our backs just above our waist, we would not live very long. Each reddish-brown kidney contains a million nephrons, with 30 miles of filters. About every thirty minutes while we are active, all our blood goes through one or the other of these masterpieces. That means that 7 to 8 liters of our blood goes through them about 20-25 times a day! That’s 45 gallons of blood being filtered each day! Each of these 5 ounce organs is about the size of your fist (4 inches long, 2 ½ inches wide, and 1 ½ inches thick). Each is attached to a major artery and vein of the body. 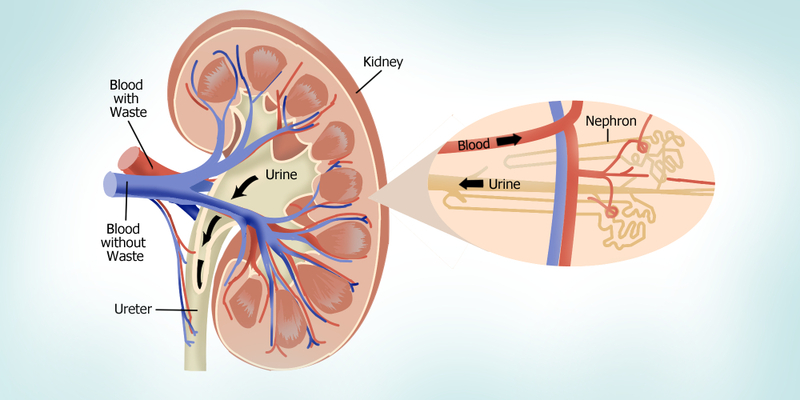 Blood flows into the top of the nephron and 95-99% of the fluids flow out the bottom to return to the body. The waste materials are squeezed through the ureter to the bladder to be stored until they are eliminated. Chemical signals from the pituitary gland determine how much of certain substances the kidney should remove. For example, both nicotine and caffeine produce too much of this hormone and the kidneys slow down. Alcohol slows the pituitary and increases the work of the kidneys, but a lot of the water is reabsorbed into the blood by osmosis. As the body functions, waste products are produced. For instance, creatinine is produced when muscles contract. Salt and other chemicals must also be kept in balance in the blood stream. We need salt to maintain the fluid in our blood cells and to transmit information in our nerves and muscles, but too much salt can be harmful. Hormones must also be filtered out after they do their job and excess chemicals such as sugars must be removed. Water level must also be kept in balance. Though 95% of urine is water, the other 5% contains these poisons that, if allowed to build up in our systems, would be fatal. We are able to live with only one kidney and, in fact, some live with partial functioning of one kidney. But if the kidneys fail entirely, that person has only days to live without dialysis, that is, artificial blood filtration. How all this works is too complicated for an article this size. Guyton’s Medical Physiology textbook contains 70 pages on body fluids and the work of the kidneys and bladder. The chemistry involved is staggering. The most complex blood filters designed by engineers cannot begin to duplicate the work of the kidney. It would be folly to try to explain the work of a dialysis machine as the result of a series of amazing accidents. No, intelligent engineers have worked years to develop machines that can somewhat duplicate the work of the kidney. Why is it so difficult then to admit the kidney is designed by someone superior to these engineers? A further thought– if man and animal evolved, it is obvious that the kidney would be required in the beginning, else the life form would die of toxemia within days. This is yet another example of the absurdity of trying to explain complex interdependent required systems of the body as the result of random changes over long periods of time.